Item: Their Majesties thanked Baron Adhemar de Villarquemada for his lengthy and honorable service to the Kingdom and the Barony of Dragonship Haven, in witness of which Their Majesties awarded him a good and proper pension, the which deed was memorialized in a document created by Eloise of Coulter. Item. 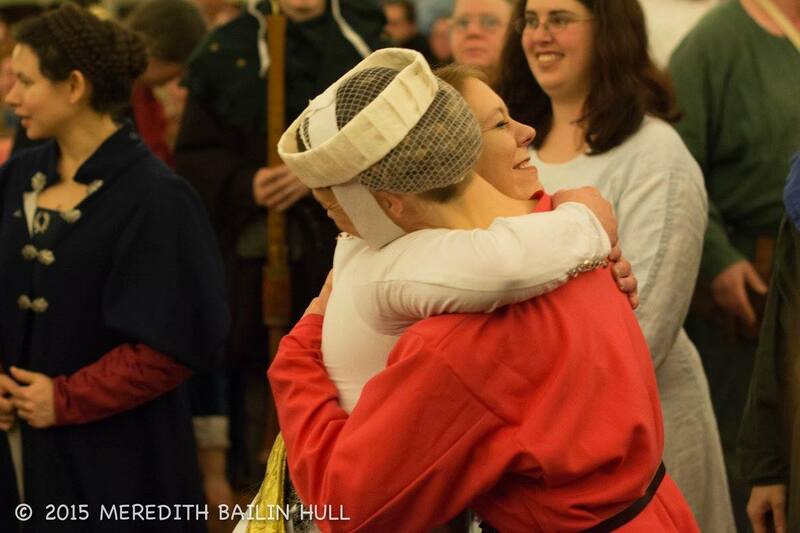 Their Majesties invested Joseph of the Red Griffin as Baron of Dragonship Haven, the which deed was confirmed in a document created by Emma Makilmone and Henna Sinclair. Item. 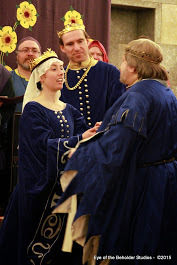 Their Majesties invested Bronwen Rose Greylyng as Baroness of Dragonship Haven, the which deed was memorialized in a document authored by Grim the Skald, calligraphed by Alexandre Saint Pierre and illuminated by Camille des Jardins. Item. 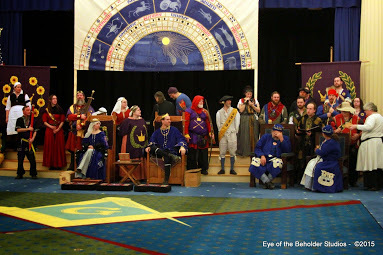 Their Majesties accepted the fealty of the new Baron and Baroness of Dragonship Haven. Photo courtesy of Countess Caoilfhionn. Item. 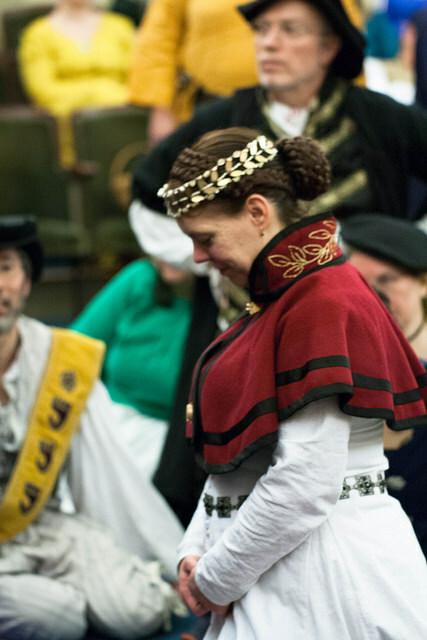 Their Majesties sent Aildreda de Tamworthe to sit vigil to decide whether she would accept the accolade of the Order of the Laurel. Item. Their Majesties sent Ysemay Sterling to sit vigil to decide whether she would accept the accolade of the Order of the Laurel. Item. Their Majesties summoned Reinne Chevalet la Mareschale before the Court and thereupon awarded her Arms, the which deed was memorialized in a document created by Cezilia Raposa. Item. Their Majesties caused Amis Mwyn to be brought before the Tyger Thrones and, so doing, awarded the said Amis Arms, the which deed was confirmed in a document created by Aesa feilinn Jossursdottir. Item. Their Majesties commanded Geoffrey Hart to appear before them, whereupon they awarded him Arms, the which deed was confirmed in a document created by Onóra inghean Uí Ruairc. Item. Their Majesties commanded Leon the Navigator to attend upon them and, praising his labors and his skills in matters of thrown weapons, inducted him into the Order of the Golden Mantle, the which deed was memorialized in a document authored by Colin Mackenzie and calligraphed and illuminated by Sorcha Dhocair inghean Uí Ruairc. Item. 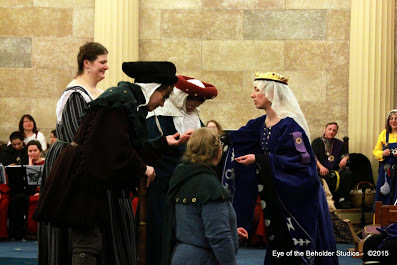 Their Majesties summoned the noble and good Johanna de Glastingburi to appear before the Court, whereupon they inducted her into the Order of the Silver Crescent, the which deed was confirmed in a document created by Aleksei Dmitriev. Item. Their Majesties made Awards of the Golden Lyre to the following musicians who had played for the dancing this day: Deonna von Aachen, Rufina Cambrensis, John Elys, and Isabeau d’Orleans. Item. Their Majesties awarded Arms to Aleksei of Nordenhalle. Item. 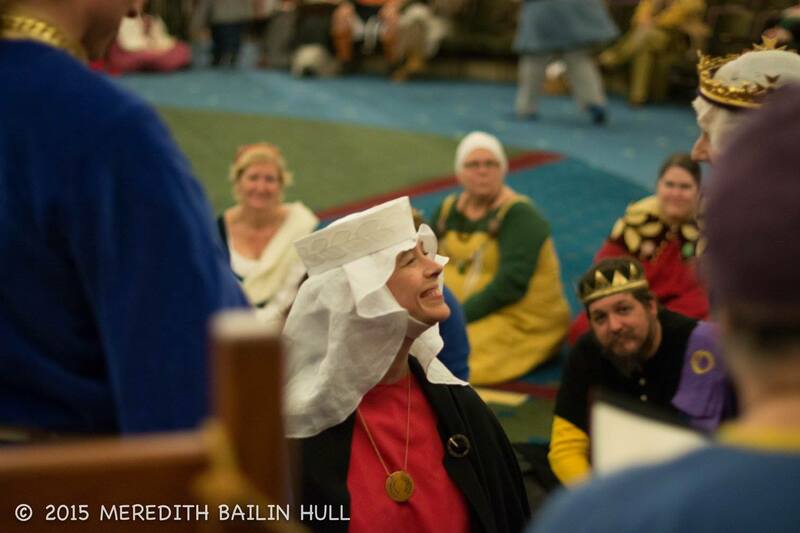 Their Majesties caused the good lady Isabeau du Valle to be brought before the Tyger Thrones and, praising her skills in beadwork and other noble arts, inducted the said Isabeau into the Order of the Maunche, the which deed was confirmed in a document created by Katherine Stanhope. Item. 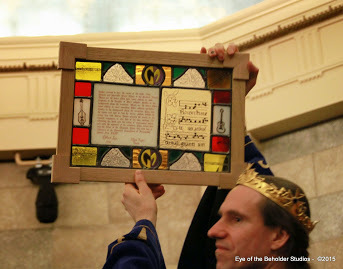 Their Majesties summoned from among their musicians the good man Rufus Bowie and, praising his skills in music, endowed him with the Order of the Maunche, the which deed was confirmed by a gift of glass created by Solskinn of Smoking Rocks with words by Nest verch Tangwistel. Item. Their Majesties called Lavina Attewode before the Court and awarded her Arms, the which deed was memorialized in a document authored by Lucius Aurelius Varus and calligraphed and illuminated by Saerlaith ingen Chennetig. Item. Their Majesties awarded arms to Tegwen ferch Cydifor ap Bleddyd, the which deed was confirmed in a document created by Eowyn Eilonwy of Alewife Brook. Item. Their Majesties called Hedinn inn Raudi before the assembled Court and, praising his valor and skills upon the list, endowed him with the Order of the Tygers Combatant, the which deed was memorialized in a document created by Lada Monguligin. Item. Their Majesties consulted their learned astrologer, Master Anton of Winteroak, to determine the just and proper course of their reign. Item. Their Majesties summoned the good and noble Aildreda de Tamworthe to hear her answer to the question before her; Their Majesties then took testimony from noteworthy Peers of the Realm concerning the said Aildreda; and finding it just, fitting and right that the said Aildreda be elevated to the Peerage, caused the said Aildreda to be inducted into the Order of the Laurel and awarded Arms by Letters Patent, the which deed was confirmed in a document authored by Lucien de Pontivi and Peregrine the Illuminator, and calligraphed and illuminated by Isabel Chamberlaine. Photo courtesy of Raziya Bint Rusa. Item. Their Majesties called before them the right and honorable Ysemay Sterling to hear her answer to the question before her; Their Majesties then took testimony from honored Peers of the Realm concerning the said Ysemay; and finding it just, fitting and right that the said Ysemay be elevated to the Peerage, caused the said Ysemay to be inducted into the Order of the Laurel and awarded Arms by Letters patent, the which deed was confirmed in a document authored by Toki Redbeard and calligraphed and illuminated by Fiona O Maille. Item. Their Majesties thanked the musicians who had played for both Courts and during the day’s festivities.